The mute swan is commonly associated with romance because of its stark white beauty, graceful swimming, and the fact that it mates for life. 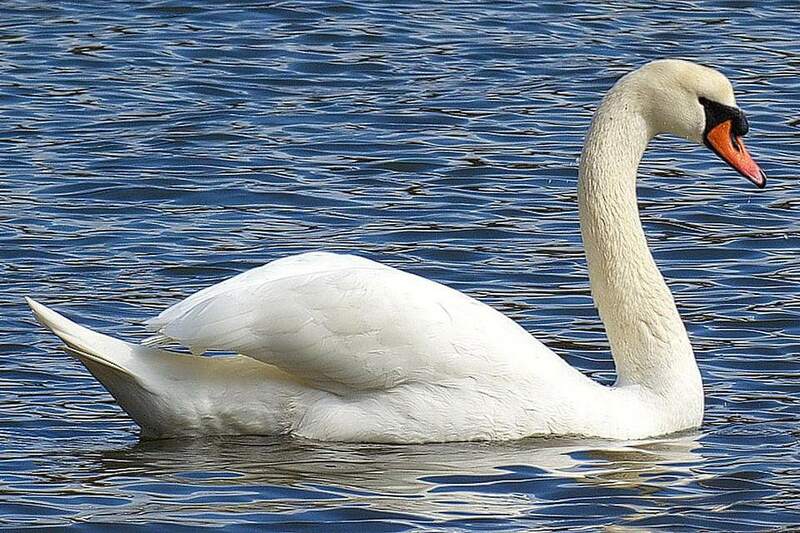 Yet there are many things most people don’t know about this swan, including that this member of the Anatidae bird family is not native to North America and it can be one of the most aggressive waterfowl. This fact sheet can introduce birders and non-birders alike to many things they never knew about the mute swan. The mute swan is very distinctive with its long neck and white plumage, but several other swans and geese can look very similar. Knowing the field marks to check on this bird can help birders feel confident with its identification. Genders are identical with all white plumage, though the long neck, which is often held in an S-curve, may show a buff, tan, or brown wash from dirt or plant debris. The orange, spatulate-shaped bill has a black edge and tip and a prominent black basal knob at the base. The bare-skinned lores are black, as are the eyes, legs, and webbed feet. Juveniles look similar to adults, but have a brownish wash on the plumage, especially on the head, neck, and wings. As they mature, their plumage may appear more mottled. Juvenile birds have a gray-black bill. Despite their name, these birds are not really mute. Adult birds are usually silent but will use hisses, barks, and rattling snorts when threatened, and juvenile birds have additional whining calls to attract attention. Mute swans are native to Europe and Asia, and they have been heavily domesticated in Europe and introduced as domestic waterfowl for estates, parks, and gardens throughout North America. Released birds have formed feral populations around the Great Lakes as well as the North Atlantic coast from Massachusetts south to Virginia. The occasional released bird or pair may be found nearly anywhere, typically near large open areas of water including lakes, large ponds, sheltered bays, bogs, and marshes. They can be found in both freshwater and brackish habitats. Mute swans in Europe may migrate to the Middle East in winter, but North American birds typically do not migrate. Instead, the birds stay wherever open water is available even if ice generally develops. If food is abundant or the birds are fed from supplemental feeders, they are even more likely to remain in northern areas year-round. Mute swans are graceful on the water but can appear awkward and ungainly in flight and on land. These are very aggressive birds when defending their territory and nesting sites, and they will charge and attack large birds and mammals, including humans, that they perceive to be a threat. When swimming, they may hold their wings over their backs in a puffed up position to advertise their strength, and the neck may be held in a strong S-curve as an aggressive posture. In flight, mute swans hold their necks out straight and the legs and feet extend to the end of the tail. These swans are herbivorous and eat only aquatic plants and grain. They may skim the surface of the water to collect floating morsels, or can tip up to stretch their necks under the water and search out food in mud or sand, or to nibble at submerged algae. They will also forage on land, grazing as they walk. Mute swans are monogamous and believed to mate for life, though "divorces" do occur as well as infidelity between mates. The pair will work together to create a mound of plant material in shallow water for the nest, lining it with down for extra insulation and cushioning. Where available, mute swans may also reuse other mounds, such as muskrat houses, for nesting. The nest is often positioned to be concealed by grasses or reeds. Both parents incubate the 2-10 gray or blue-green stained eggs for 36-38 days, and both parents help watch over the precocial young until the birds’ first flight at 100-150 days. Young birds learn to swim and forage within a day of hatching, but will remain with their parents in the family group for several months. Mated pairs raise one brood per year, and young swans begin breeding when they are 2-3 years old. Mute swans are not considered threatened or endangered, and in fact may be culled or closely monitored in some areas to be sure they do not become dangerously invasive. They are subject to several threats common to many waterfowl, however, including toxic pollution of waterways, fishing line tangles, and lead poisoning from sunken pellets or fishing gear. Mute swans are occasionally shot as well, often because they may be confused with other swan species that can be legally hunted. These are not typical backyard birds but they can be a common site in parks and gardens that include large water features. Mute swans will approach picnickers and visitors in hopes of handouts, but it is not wise to feed them, since bread is not healthy for swans, ducks, or geese. Furthermore, these large birds can become aggressive quickly and are best left alone. Because they are so large and unmistakable, it is not difficult to find mute swans on a variety of waterways, lakes, and ponds within their range. In fact, birders are often surprised to find these birds well outside their expected range when captive birds escape from private collections, zoos, or gardens. Mute swans may be found in freshwater or brackish habitats that support adequate vegetation for feeding, and they can occasionally be found feeding in flooded agricultural fields as well. These swans are often considered a symbol of romance and romantic love, as well as purity and unity. This symbolism comes from the fact that these birds form long-term pair bonds, often remaining as a mated pair for years, though separation and divorce are not unheard of. The mute swan's pure white plumage and graceful curves also give it romantic appeal, and these birds are often featured in wedding decorations such as cake toppers, invitations, and other accents, and they can even be rented for events and photography sessions. Quirky swan boats, which typically have enough space for a couple to sit while paddling around a lake or pond, are also inspired by mute swans and seen as a romantic date activity. Don't forget to visit our other wild bird profiles to learn even more about your favorite bird species!